Im September 2006 erreichte uns die nachstehende Original-email einer engagierten Tierschützerin in Serbian. ...es ist einfach unfassbar, wozu "Menschen" - egal aus welchen Land - fähig sind ! SOS für Strassentiere in Serbien! After they kill dogs, they put them on garbich. This are photos from 20th Sept. 2006 in town Smederevo. Before they kill this dogs, the dogs was cruelt in very small places to larger than 1,5 x 1,5 meters, were 30 dogs, without food and without water, and then go killing with T61 in the best case, but often killing go by Nuvan, Kreozan-poisons or with mallet. 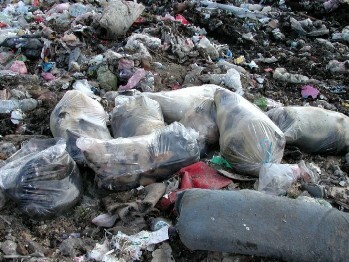 This are pictures of "New strategy for stray animals". Financial construction you knows: 90% for killing, 10% for sterilization, and the same dogs may be first sterilization and then kill, both for money of cities budget. but it is very important that you do it" (Mahatma Gandhi). 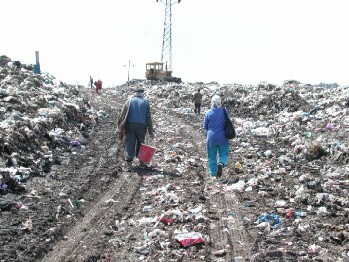 We are grateful to Mrs Vesna Arsenovic, and Mrs. Andjelka Jovanovic, because she shot this horrible photographs in Smederevo city on 20th of September 2006. 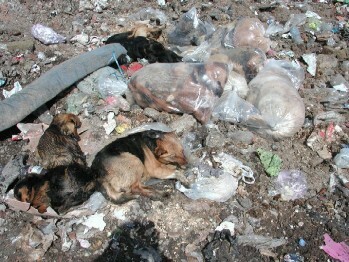 Please help to the animals in Serbia. Here is horrible situation. They want to kill even dogs at the shelters (in Valjevo, in Subotica and more). because authorities can delete yours letters. Thank You for your time and your attention to this very important and terrible situation in Serbia ! Bitte Fotos mitsenden, damit die Schergen wissen, dass wir über ihre Verbrechen an Tieren informiert sind. 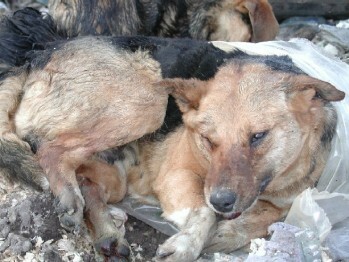 In the world wide web I learned about the terrible crueltys that happens to the animals in Serbia. I am horror stricken by what I see and hear and feel deeply ashamed for the people responsible for this atrociousness. I wish to put an immediate stop to the atrocious martyrdom and killing of street dogs in Serbia and implement a spay / neuter and release and / or adoption programme. The photos above are from the 20th of September 2006 in Smederevo! It’s a big shame to treat animals that cruel! Before these poor dogs have been killed, they have been hold in very small cages, without water and food! 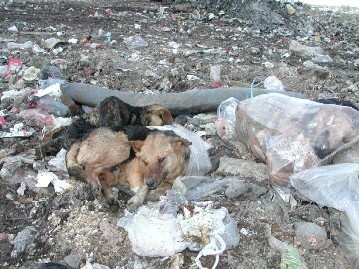 This big shame of Serbia happens every day! This is NOT acceptable in ANY way in ANY kind of civilized society. 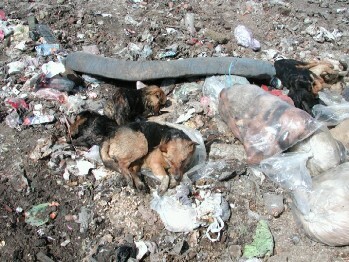 We foreward all the photos above, to show the world the dirty face of the Serbian authorities! Please fulfill the basic needs of these sentient creatures. Serbia present tactics are inhumane and to condemn. Such behavior controverts a civilized society - this is pure middle ages - but we live in the year 2006!